These four drawings by Sir William Smith, dated 1795, are from the examples of his work which are to be found in the Manuscripts Department of Trinity College, Dublin,1 and they are reproduced here with the permission of the Board of Trinity College, and from the photograph copies in the Kildare County Library. William Smith, who was a captain of engineers, is not listed in the Elmes/ Hewson Catalogue of Irish Topographical Prints & Original Drawings. 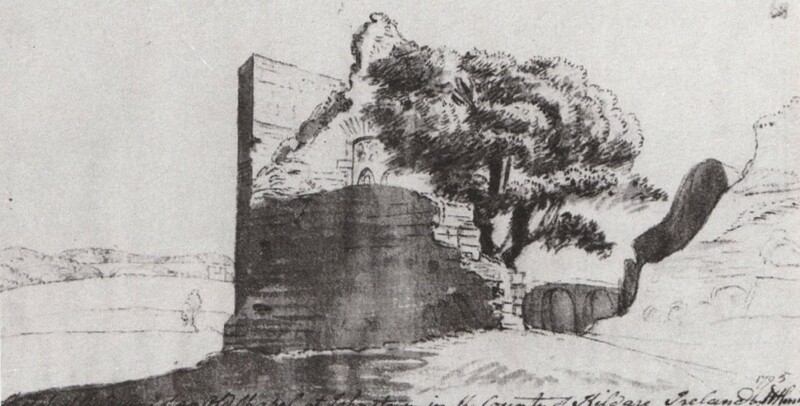 Athy Castle (Plate 1). 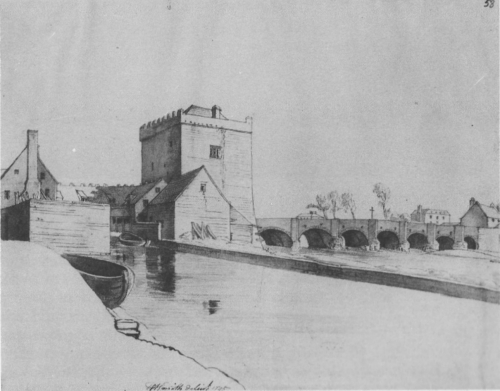 This drawing is titled: The Tower, bridge and part of the town of Athy, in the Queen’s County. N.B. the Tower used as a prison. Apart from getting his counties mixed up, the British army engineer captain produced a fine impression of the medieval bridge over the river Barrow, and which was to be replaced in 1796 by the earl of Kildare. Seven arches of the bridge are visible, and White Castle, then the jail, is shown between the waters of the river and the mill race. John Rocque’s map of Athy,2 made for the earl of Kildare in 1756, clearly shows the cutwaters on the north side of the bridge and the mill race to the east of White Castle. Seventy years later when Clarges Greene3 mapped the town for the duke of Leinster the mill had been extended over the race, and the site for a new jail had been chosen on the east side of the Barrow. Seymour Castle (Plate 2). Smith has titled this drawing as Seymour Castle, two miles from Athy, but a search of the maps of the Athy district failed to produce any site named Seymour Castle, nor is the name to be found in Kavanagh’s Bibliography of County Kildare.4 Enquiries in the town and countryside of Athy did not produce any knowledge of such a castle. 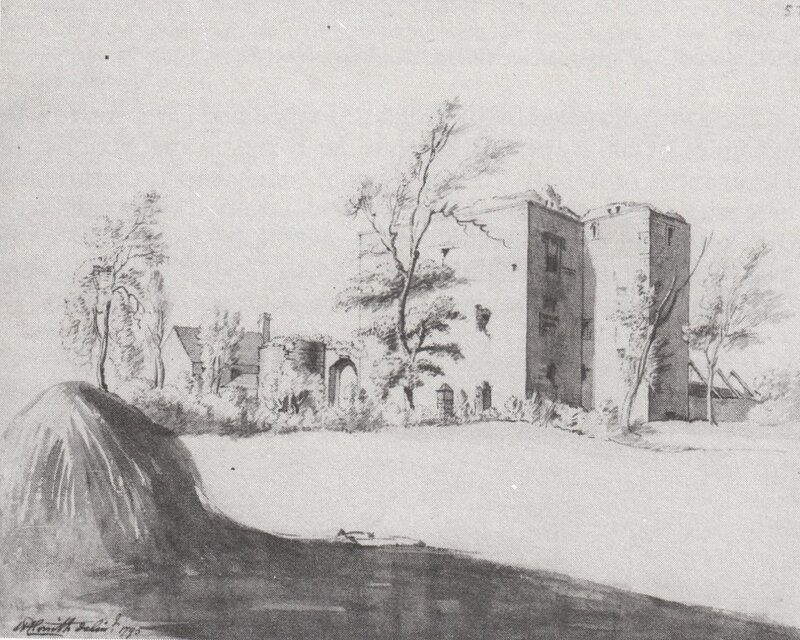 Comparison of the sketch with early illustrations of castles in the Athy area finally tracked down the place. It is Woodstock Castle, built by the St Michael family, and later, through marriage, in the possession of the Fitzgeralds. A photograph of Woodstock in volume five of this Society’s journal5 shows the castle as it was in 1908. The photograph is taken from the same angle as the Smith sketch, and it is remarkable to see how little the ruin had deteriorated in the century between the two impressions being made. Why Captain Smith designated the castle as Seymour, and located it two miles from the town, is not known. Johnstown Chapel. (Plate 3). The title of this drawing is Sketch of the ruins of an old Chapel at Johnstown in the County Kildare, Ireland. The medieval parish church of Johnstown, near Naas, was dedicated to St John the Baptist. It measured 40 feet by 18 feet, and there was a box-tomb in the centre of the building which marked the burial place of the Flatesbury family. They held much land and important positions in the county for hundreds of years.6 When Smith sketched the ruin the east window is shown as being intact. Subsequently it was damaged and in recent times it has been restored by the local community. The Celtic Cross marking the burial place of the sixth earl of Mayo, who was assassinated in 1827 when governor-general of India, now dominates the chapel. Kilcullen Bridge (Plate4). 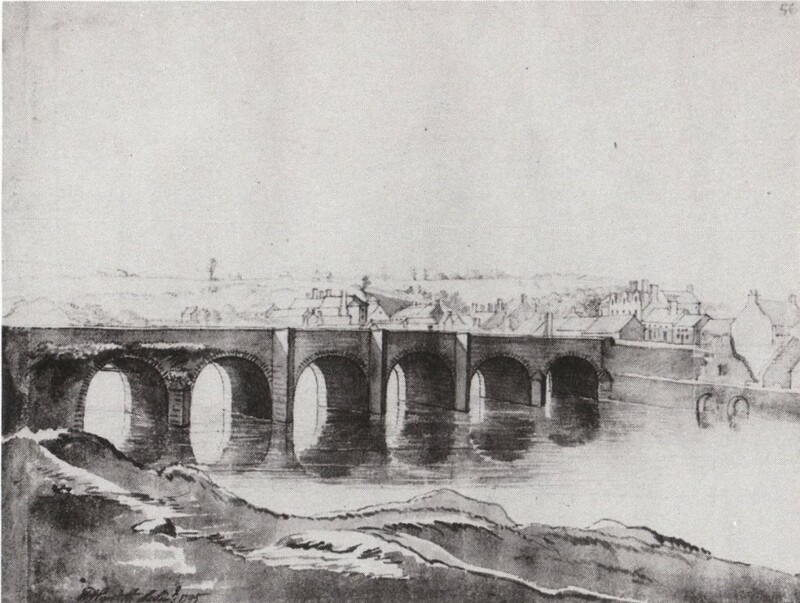 Smith stood on the south-east side of the river Liffey to make this sketch of the bridge which he titled Sketch of Kilcullen Bridge and part of the town as seen from the banks of the river. The medieval bridge at Kilcullen was destroyed in the wars of the seventeenth century, and that sketched by Captain Smith was that which, according to local tradition, had been “blessed by a friar in 1776”. In 1790 a visitor from France7 remarked on the bridge of six arches, and in 1837 it was described “as having an interesting and venerable appearance”.8 Though widened in modern times to accommodate heavy traffic, the bridge still has some semblance of its eighteenth-century origins. Thanks is expressed to Anne Fitzsimons for bringing these drawings to my notice, and to the Board of Trinity College and the Kildare County Library for permission to use them. 1. TCD MS 942/2:51, 56, 58,68. 3. Journal Co. Kildare Archaeological Society, XV, p. 485, plate 10. 4. Kavanagh, M.F. A Bibliography of the History of County Kildare in Printed books 1977. 5. J.K.A.S., V, p. 274. 6. J.K.A.S., IV, pp. 86-94. 7. J.K.A.S., XV, p. 380. 8. Lewis, Samuel. Topographical Dictionary of Ireland (London, 1837) Part 1, p. 90. 9. Costello, Con. Looking Back, aspects of history, Co. Kildare, (Naas, 1988) p.37.